This app is a great tool for any child learning multiplication. 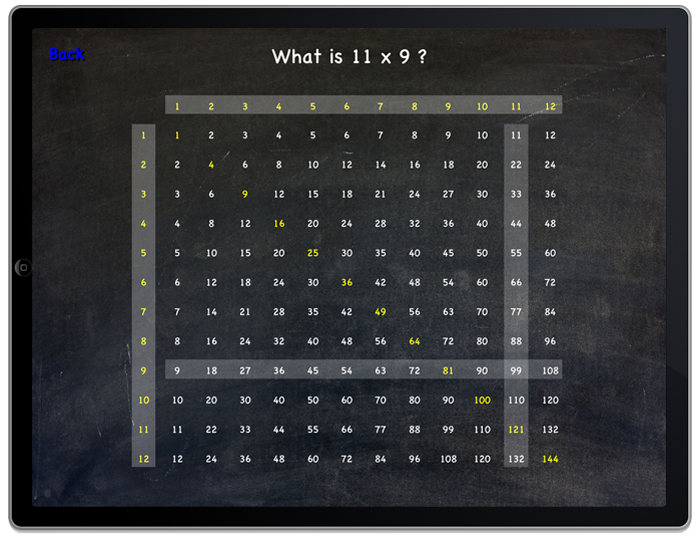 It includes a dynamic interactive (configurable) times table, and a quiz that will ask multiplication questions and keep track of the percent answered correctly. In Settings, you can configure the range of the times table (2x2 up to 12x12 or any combination, such as 5x10 where the left value ranges from 1 through 5 and the right value from 1 through 10). The questions asked and the times table shown will be in the range you select - great for starting out with simple numbers and moving up as the student advances. Tapping on any number shows the two numbers and the result of their multiplication. Customisable main window title - show your child's name in the app. Quiz mode asks multiplication questions and tracks results. This is a great tool for visualising a times table and using it to teach multiplication, either interactively with the child, or letting the child play on his own.